Happy Anniversary! If you’re marriage is anything like ours then you are looking back and thinking, “Wow! Has it already been a year?” Time just flies by these days. Whether you’ve been married one year or twenty years, finding that perfect present can be stressful. For the traditional gift giver, there is a list of themed present ideas for each year of marriage. When you don’t have a specific gift in mind, this can make it a little easier to narrow down your choices. A girlfriend of mine (who loves jewelry) once said that when her husband isn’t sure what a good anniversary present would be, he has two go-to’s – diamonds and pearls. There’s no arguing here. We love both of those things at STP, but for our first year wedding anniversary we decided to give the traditional theme present ideas a try. The theme for the first year is paper. Paper might seem lame at first, but it is a great base for many creative present ideas. Wow your spouse with one of these 5 Easy Paper Gift Ideas for Him or Her. Although you might not be able to actually get your hands on a “paper” gift certificate, you can’t go wrong letting your spouse pick out what they really want from their favorite place. Gift certificates are great for those who tell you that they don’t want anything. Don’t you hate that? Or better yet, give them the gift of fun or relaxation. She might like a day at the spa, massage, or mani-pedi. He might like a round of golf. If you have joint bank accounts and don’t see the value in giving individual gifts anymore, why not get a gift certificate for two? Doing something together is a fun way for you both to enjoy the “gift” – think couples massage or doubles for golf. 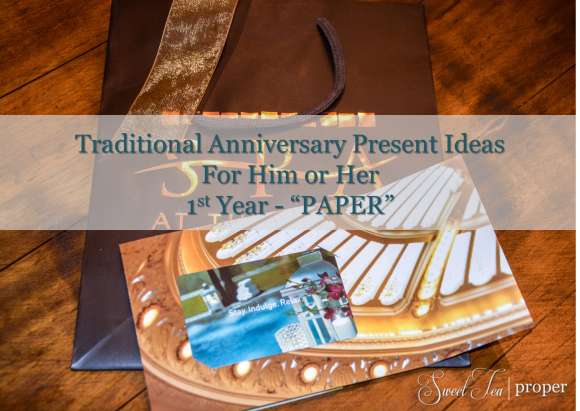 Depending on your spouse, this “paper” gift might be better suited in a digital form. I personally love magazines, you know, the physical kind that come in the mail and you hold in your hand. Unlike newspapers that rely on breaking news, the articles in a magazine are based more on creativity than time sensitivity. Add in some beautiful or inspirational photographs and I’m in reading bliss. For every hobby under the sun, there is more than likely a magazine rest to celebrate it. While the newspaper business has been steadily declining over the years, there are still some who love the nostalgia of reading a physical paper. If the local paper seems boring, consider a more popular national publication. Here is another “paper” gift that might be preferred in the digital form, but then again, how would you be able to take in the smell of sweet nostalgia? For the literature-loving spouse, there are few things greater than an original copy of a classic novel. Check the library (if your local one has a “store” inside) or an old book store to get your hands on one of these. If you are looking for something specific, try eBay or another auction site. Make sure to give yourself a few weeks so it has time to ship. Perhaps the “classics” aren’t for your spouse. There is always a best-seller waiting to be read. Head on over to your local bookstore to pick up the latest “must-read”. In a world where hand-written anything is becoming more rare, we think personalized stationery is a must. Whether sending a letter or thank-you note, it is so refreshing to receive something in the mail other than a bill. For him, go with something classic and sleek. For her, consider something fun and colorful. Either way, make sure to have it printed on good quality paper and you can’t go wrong with a simple monogram at the top. Since you are already celebrating, why not pick out something fun that you can do together at a later date? With football season in full gear, check stubhub.com for two seats to an upcoming game. For the music lover, check ticketmaster.com and see who is touring in the next few weeks. Events aren’t limited to music or sports either. Now is a great time to try something different. Maybe a play, musical, ballet, or opera is a more appropriate gift for your spouse. You know better than anyone else so take your pick! While most of these ideas can be given in a digital format, you can always include a sweet card to keep the “paper” theme alive. A good gift doesn’t have to break the bank. The key is to be thoughtful and make it personal. Those presents are the ones that your spouse will remember for years to come. Here’s to many more! Cheers!